Imbue with tempting elation the mind of a childhood friend by gifting that friend this Fetching Gift Pack from Haldiram and bedeck your friendship. This Gift Pack arrives with 250 gm Haldirams Soan Papdi (Gross Weight), 250 gm Haldirams Kaju Katli (Gross Weight), 250 gm Haldirams Khatta Meetha Mixture (Gross Weight), 2 pcs Toblerone Chocolates and 5 pcs Homemade Chocolates. 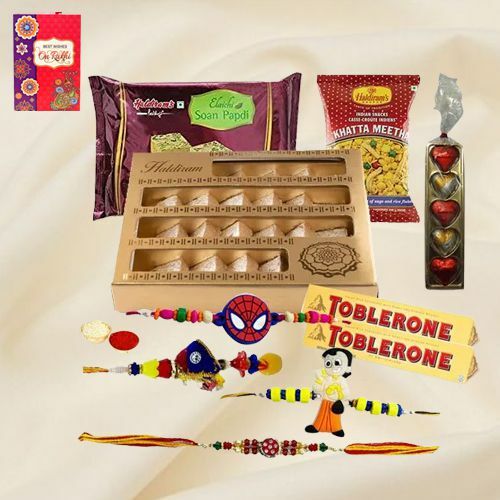 Haldirams Ambrosial Assortment of - 500 gm Haldirams Soan Papdi (Gross Weight), 250 gm Haldirams Kaju Katli (Gross Weight), 250 gm Haldirams Khatta Meetha Mixture (Gross Weight), 2 pcs Toblerone Chocolates and 5 pcs Homemade Chocolates with 1 Set Bhaiya Bhabi Rakhi, 2 Kids Rakhi and Roli Tilak Chawal. Haldirams Ambrosial Assortment of - 250 gm Haldirams Soan Papdi (Gross Weight), 500 gm Haldirams Kaju Katli (Gross Weight), 250 gm Haldirams Khatta Meetha Mixture (Gross Weight), 2 pcs Toblerone Chocolates and 5 pcs Homemade Chocolates with 1 Set Bhaiya Bhabi Rakhi, 2 Kids Rakhi and Roli Tilak Chawal.